Cumin | Become Healthy or Extinct! Cumin is the dried seed of the herb Cuminumcyminum, a member of the parsley family. Cumin seeds are used in the cuisines of many different cultures, in both whole and ground form. It also has many uses as a traditional medicinal plant. Cumin has been in use since ancient times. In the ancient Egyptian civilization cumin was used as spice and as preservative in mummification. Seeds excavated at the Syrian site Tell ed-Der have been dated to the second millennium BC. In Sanskrit, cumin is known as Jira “that which helps digestion”. In the Ayurvedic system, dried cumin seeds are used for medicinal purposes. These seeds are powdered and used in different forms like kashaya (decoction), arishta (fermented decoction), vati (tablet/pills), and processed with ghee (a semi-fluid clarified butter). It is used internally and sometimes for external applications also. In southern India, popular drinks such as Kerala and Tamil Nadu are called jira water, which is made by boiling cumin seeds. It is believed that cumin is beneficial for heart disease, swellings, tastelessness, vomiting, poor digestion and chronic fever. Improves Digestion and Increases Metabolism – Cumin stimulates the production of enzymes that break down fat, sugar, and starch. It also increases metabolism slightly. 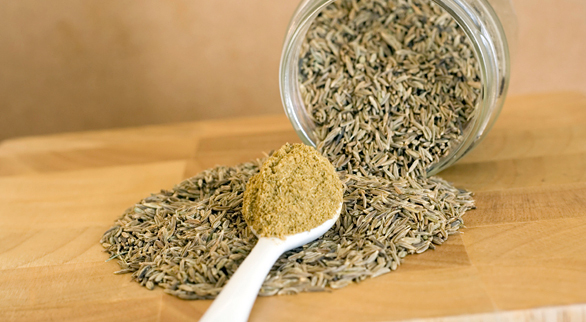 Boosts Immune System – Cumin seeds are a very good source of iron. Just one teaspoon of cumin seeds provides around 7 percent (around 1.3 mg) of the daily value for iron. Iron is a mineral that makes up an important part of haemoglobin, the substance in blood that carries oxygen throughout the body. Additionally, the human body uses iron to enhance the immune system functioning, thus helping the body to fight against contagious diseases. Fights Anaemia – Add cumin to your food to fight anaemia due to iron deficiency. Cumin is high in iron content, which aids in the red blood cell formation. Common Cold, Asthma, Bronchitis – Cumin has been found to be very effective in the treatment of common cold, asthma, and bronchitis. It helps in diluting the phlegm in the chest, thereby helping the body in easy expulsion of it. It is a disinfectant that kills the virus of common cold. The large iron content in cumin strengthens the immune system. Cures Digestive Disorders – The oil present in cumin stimulates the salivary glands. The thymol present in cumin improves the sluggish digestive process. Taking cumin with a little lukewarm water greatly helps in banishing stomachaches. Additionally, soaking cumin seeds in water overnight and consuming the water is beneficial while having acidity. It also helps in relieving bloated feeling. Carminative Property – Cumin helps relieve or reduce flatulence (abdominal gas), thus increasing appetite and aiding in digestion. A cup of tea made from cumin seeds taken thrice a day after a meal will provide relief. To prepare the tea, add one teaspoon of cumin seeds in 1.5 litres of boiling water and allow it to simmer on slow fire for 15 minutes. Strain and sip hot to get best of results. Anti-carcinogenic – Cumin has been proven to help the body fight cancer cells. It helps slow down the growth of tumours. The cancer-fighting capability is due to cumin’s potent free radical scavenging abilities. Pregnancy and Childbirth – Boil water with one tablespoon of cumin seeds. This solution gives good relief from morning sickness. Adding a bit of honey to this solution and drinking it once a day helps with the healthy development of the foetus, and also with easy childbirth, as well as it increases the quantity of breast milk. Hypoglycaemic Properties – Studies confirm that cumin does have a beneficial effect in treating type 2 diabetes. Stimulates the Liver – Cumin also stimulates the liver to produce more bile, thereby aiding digestion. Skin Soother – Cumin is very effective in curing insect bites, healing boils, as well as preventing infection in minor wounds. Grind cumin with enough water to make a smooth paste and apply to the affected area. Wash off once it dries. Cumin is also rich in vitamin E, which makes the skin glow. Natural Laxative – Cumin powder acts as a laxative because of the presence of cuminaldehyde and certain pyrazines in the essential oils. These have carminative, stimulating, antifungal, antibacterial properties. Cumin is also rich in dietary fibre content. Cumin has also proved to have strong anti-fungal action and is therefore used against candidiasis. Some studies also showed that the antioxidant activity of cumin was far more potent than vitamin C.
Black cumin seeds and its oils have historically been used to treat respiratory diseases, including asthma. They also act as a relaxant, and display both anticholinergic (reducing spasms in smooth muscle) and antihistaminic (blocking allergic reactions) effects and work as a bronchodilator as well. Another study evaluated the antioxidant content of Cumin and found it more effective than other common antioxidants including Vitamin C. Due to its high antioxidant content, some lab research has even found that it might have a role in fighting cancer.